Electric powered S-1000 is from the very latest generation with retractable landing gear, allowing the camera to film all around the machine. We offer 3-axis Zenmuse Z15 stabilized gimbals for capturing perfectly levelledand stable images, no matter the movements of drone. We shoot aerial images using a Sony NEX-7 camera, featuring a 24 millions pixelssensor and capable to shoot fullHD videos, up to 60 frames per second.You have the guarantee to obtain sizzling images, with stable shots,high-quality resolution and impressively vivid colours. 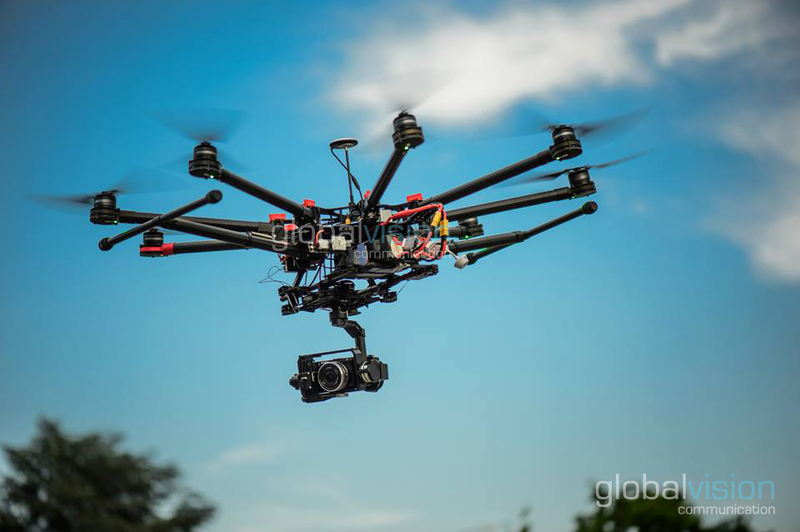 Our drone service is intended for marketing professionals, production houses, TVs and visiting journalists requiring some unconventionnal images. Our UAV drone service is readily available from our main office in Geneva, for assignements in Switzerland and Europe, or from our representative office in Ho Chi Minh City, for all assignments in Vietnam and Southeast Asia. Contact us now for more information on this flycam UAV drone service or to reserve for your next aerial shooting.